The success of the US navy’s amphibious warfare campaigns in the Pacific often masks the other side of the coin—the success of the Japanese amphops campaign in the same theatre. A look at Jane’s Fighting Ships of 1939 shows that the Japanese navy had no landing ships of any kind. Most of their landings were carried out from large and flat-bottomed boats exactly as it was done in the Mediterranean in the nineteenth century. Photographs of Japanese troops landing ashore in Thailand, Borneo and Malaya show them disembarking from ships’ boats and from some flat-bottomed barges. Yet, could there have been a more brilliant exposition of amphibious warfare supporting the land campaign than Tiger Yamashita’s capture of Malaya? Planning for the Malayan campaign began barely three months before it took place. The landings had to take place on 8 December 1941, the same day across the international date line as the attack on Pearl Harbor. Yamashita, a victim of the power play in Tokyo, found himself in the opposite camp to General To jo. It was therefore only in November 1941 that Yamashita was appointed supreme commander of the Malaya operations. The schedule, scope and momentum of the Malayan campaign is breathtaking in its simplicity and audacity. The landing force consisted of the 25th Army with three full-strength infantry divisions, one of them almost completely motorised. Supporting them were two regiments of artillery and a tank brigade. Air cover was provided by the 3rd Air Division composed of approximately 450 aircraft. 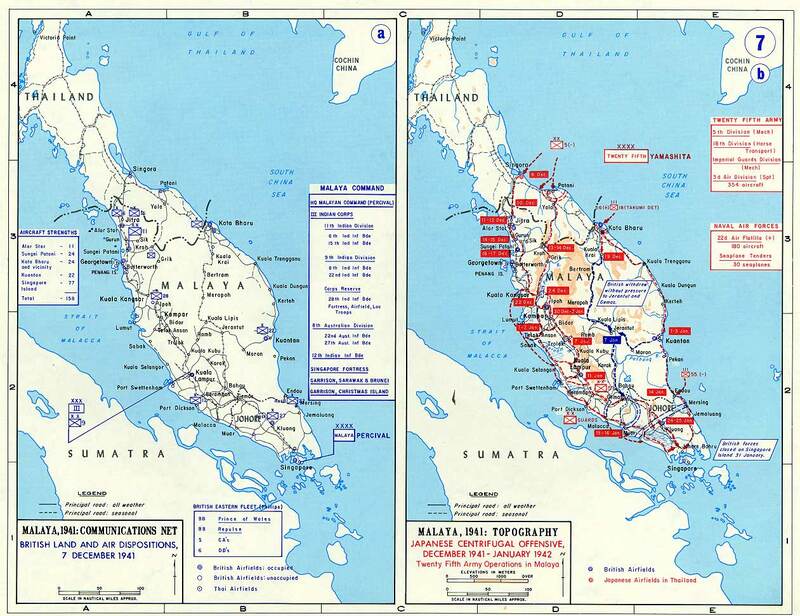 A map of Malaya with the main road communications shows that the British expected the landings on the east coast, and it was not difficult to guess that they would take place at Singora and Patani, with a possible landing opposite Kota Bharu to capture the airfields. The Japanese navy had no published doctrine for amphibious warfare and apart from the responsibility for screening the landing force, the naval commander had no say over the loading of the merchant ships, their manning, or their operations. The ships in fact were non-specialist and summoned at the last minute from various ports: they arrived in Sama, the embarkation port, only on 3 December 1941, barely 120 hours before H-hour. Of the three divisions, two had never conducted an amphops before. The entire force split into three convoys; the first two landed at Singora and Patani as planned and the third at Kota Bharu. The British had rightly assessed that the key to any Japanese success lay in a favourable air situation over the amphibious convoy. However, this aspect of the matter was badly handled by the British with poor reconnaissance, poor identification and poor tactics, with the result that Yamashita’s forces landed practically unopposed and the ships got away from the landing area before there was any reaction. Thus far, it may be concluded that Yamashita’s success was historically inevitable, given the British mindset in the Far East, but what followed is text-book amphibious warfare in support of land operations. Singapore fell on 15 February 1942, nine weeks after the first landings had taken place. The speed of advance to get through a 700-mile campaign, pause before Singapore, plan the attack and execute it, all in nine weeks, was largely made possible by repeated amphibious bypassing moves down the coast of Malaya. This is most interesting. The meagre landing resources of the Japanese army had been used in the landings at Singora and Patani. The landings executed by the 5th and 18th Japanese Divisions at Taping, towards Telak Anson on Kuala Selantor, against Port Swettenham and Malacca, had all been carried out in craft captured by the Japanese during the course of their advance. All landings were impromptu and improvised. The Japanese navy had not yet begun to operate in the Indian Ocean, their forces had not moved west of Singapore. These flanking amphibious moves were all put together in various kinds of motorised and country craft and they succeeded because they had surprise on their side; there was no bombardment and no Naval Gun Fire Support (NGFS). In fact, Yamashita had achieved surprise at the very first landings because he had insisted there be no bombardment, a plan agreed to by the navy only after painful arguments by both sides. The Japanese performance in amphibious warfare during the rest of the Pacific campaign is equally remarkable. The entire campaign for Guadalcanal was carried out by non-amphibious ships, certainly by the Japanese and occasionally also by the US. Japanese troops arrived in transports that were often beached and abandoned. The final withdrawal of the Japanese survivors, when they had decided to abandon Guadalcanal, was carried out entirely by 20 destroyers. The use of the sea by both navies and armies to influence the land battle, despite there being no specialised amphibious vessels nor a peacetime investment in an amphibious navy, is highlighted in these examples to show that failure to act similarly on other fronts arose more as an obstacle in the mind rather than in reality. It is true that the best-executed landings required enormous preparation, both in peacetime funding for specialised vessels and in softening the beach defences prior to the actual landing. But the Pacific landings, where such examples are the most numerous, were carried out on small islands. There was no choice of a beach that might achieve surprise, the approach over the ocean involved more than a day’s passage, and no all-night transit could be resorted to in order to evade daylight surveillance and identification. Amphibious operations in support of continental wars do not have these limitations as surprise can be often achieved based on the timing or occasion chosen to execute such landings as well as in the choice of the site of the landing. Corbett was extremely perspicacious in his discussion on the tactics to be adopted while undertaking amphops. He was well ahead of his time and much of his advice can be found without alterations in the US navy’s Manual for the Conduct of Amphops even today. Corbett was also the strategist who attempted to balance the role of navies away from the purely Mahanian big battle theory into its uses in supporting the army in a continental battle. But the entire framework of Corbett’s thinking lay largely in Britain’s role in Europe, where any interventions must eventually take the characteristics of an amphibious operation. To advocate amphops in continental wars in the 1990s will be somewhat of an uphill task unless the participating navies are major players, as was the Japanese navy in 1941. Corbett was the first to attempt to delineate a possible strategy for a maritime power engaged in war with a superior continental power. We, therefore, also have with Corbett the beginning of a maritime strategy for continental wars, both in this hypothesis and in some subsequent theories. He reined in those maritime thinkers who had taken the bit in their teeth after Mahan’s work in tending to portray sea power as an end in itself. Corbett insisted that the importance of sea power lay in its ability to influence history only so far as it could affect the course of continental wars; it could not affect the course of history by itself. Corbett also stressed the importance of raids in force along the coast, even though they be unsuccessful, as a means of diverting enemy strength from the main theatre of land operations. He was the first maritime strategist to think seriously about the direct contribution that maritime strategy could make to a land war. It has been suggested that as Jomini influenced Mahan, Corbett was influenced by the most brilliant writer on military affairs—Clausewitz, even though Clausewitz had nothing to contribute to the conduct of wars at sea. It is interesting to compare the course of some of the actions in World War II with the maritime strategy suggested by Corbett. When an indignant naval officer suggested at Dunkirk that the same effort in sealift could have been expended in taking reinforcements to Dunkirk instead of taking troops off the beaches, a navy/maritime strategist retorted that Dunkirk was the best thing that had happened to Britain, as the Germans would be forced to fight a maritime war instead of the British army sacrificing another generation of young men in a protracted land war on the continent. This entry was posted in Naval History, Strategy by MSW. Bookmark the permalink.